Would you be into the concept of being able to speak telepathically? I can say that hands down YES I would very much be into the ability to speak telepathically. It’s probably why this particular ability is one that is a bit more prominent in my series The Elves of Eytherfel. It’s just something that has always fascinated me. I also personally believe that the ability to speak telepathically truly does exist in parts of our world and in different forms. 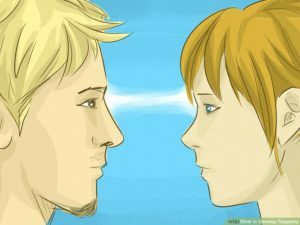 There’s been little incidents in my own life where I’ve experienced a hint of the possibility of a telepathic connection, in particular with my brother. Nothing massive or obvious, but just little things that are later revealed through conversations. Like waking up inexplicably and noticing a very particular time, like 2:31am, only to learn later that my brother was also awake at that exact time. There’s even been times when such an occurrence has affected our mom as well as the two of us. Granted it’s nothing conclusive or clearly defined, but it’s the type of thing that certainly makes you question “what-if” and “I wonder” type thoughts. Not to mention the massive benefits that the ability to speak telepathically would provide me as a parent. I was going to list some examples, but seriously that would be a list that could be a book of its own! Although there is one story that I have to share. When I was very young my mom gave me a little kick under the table at a restaurant, no doubt in an attempt to shut me up on something inappropriate. Well I bet she would have very much appreciated the ability to speak telepathically on that one when her kick was greeted by me loudly asking her why she was kicking me under the table! I’m also quite sure there are numerous scenarios where my own kids would love nothing more than to send me a silent plea to not embarrass them! Is there any downside to speaking telepathically? The great aspect of the ability to speak telepathically is that it’s not all that different from having call display on your phone, basically you can choose to answer the incoming communication or not (some embarrassing moments are just too good to pass up!). But there’s no intrusion of privacy; and it could really help people to get out of difficult situations, especially if one person doesn’t pick up on certain body language tell-tales but a friend does. It could also help to prevent hurt feelings as there’d be no need for whispering in front of others, or running the risk of sensitive information being overheard. I’ve pondered this one for quite some time and I really can’t come up with any major negativities or downsides to having the ability to speak telepathically. Is this because I’m idealistic and biased by the fact that I love the idea of being able to speak telepathically? What’s your opinion? I need to share a confession… I’m really enjoying this series of articles that I’m putting together for you! I hope you are too! ← Is communication becoming a lost art?